This Dome Perc Bong of Grace Glass Limited Edition is a special piece of glass art that will excite your senses! It comes with some light touches of purple upon the sturdy heat resistant borosilicate glass, formed in the shape of a flat base bottle tube. It is intended both for herbs and oil users. Your herbs are placed onto the detachable female bowl equipped with an inside screen and handles on the sides for easily lifting it up. The bowl connects to an inside slithole diffuser via a built-in chillum with a sure ground of 18.8mm diameter. A dome percolator will break up your smoke. With the Grace Glass logo featuring at the top of the tube, the bong ends up in a mouthpiece ring for a more pleasant flavor. 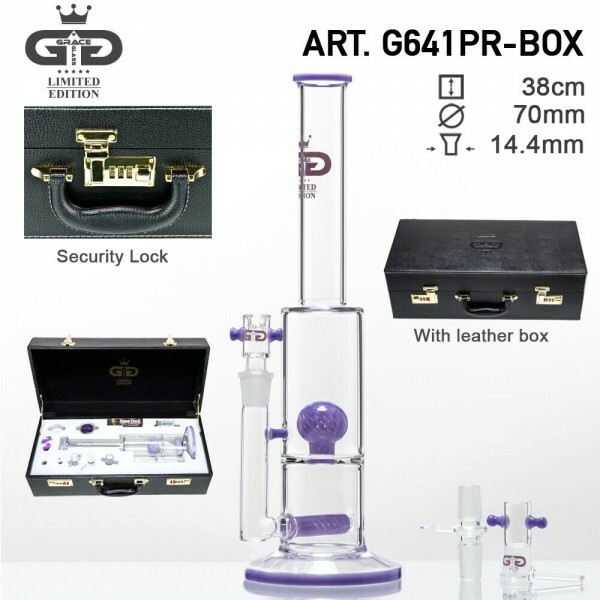 Finally, the bong comes in a luxury leather box with a security lock, including a 1x grinder, a 1x silicon jar, a 1x32 filter tips, a 1x Snoop Dogg paper, a 1x oil dome, a 1x oil nail and a 1xSG adapter 18.8mm to 18.8mm. It is therefore intended also for oil use!